As Tom Shadyac professes in his film “I AM:” we are all connected. Each person on this planet is connected to every other man, woman and child, and it goes deeper still … all of creation is connected. Our connectivity mandates that we make good choices because even the least of our actions affects the world around us. 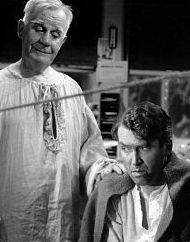 Last night, my wife and I completed our annual viewing of “It’s a Wonderful Life.” When a smiling George Bailey ‘winks’ to heaven in the final scene and says, “Atta boy, Clarence,” I always turn to Marie and say, “That is the greatest film ever made.” In years past, we would frequently entertain our young kids at the supper table with ‘Quiz Time.’ One of my favorite questions was “What is Angel Second Class Clarence’s last name?” The kids are all grown up now, and I don’t have to ask that question anymore because everyone knows it’s ‘Oddbody,’ Clarence Oddbody. “It’s a Wonderful Life” magically portrays how we are all connected. Angel Clarence Oddbody sums it all up in this classic line from filmdom. “Strange, isn’t it? Each man’s life touches so many other lives. Keep that truth in your mind throughout the year knowing that you are responsible to your fellow inhabitants on this planet Earth and to all creation for making good choices and doing the right thing. Your actions affect all of us today and tomorrow. Use your free will wisely. It is a wonderful life, and we can make it even better for our generation and for those to come. Merry Christmas and Let There Be Peace on Earth.